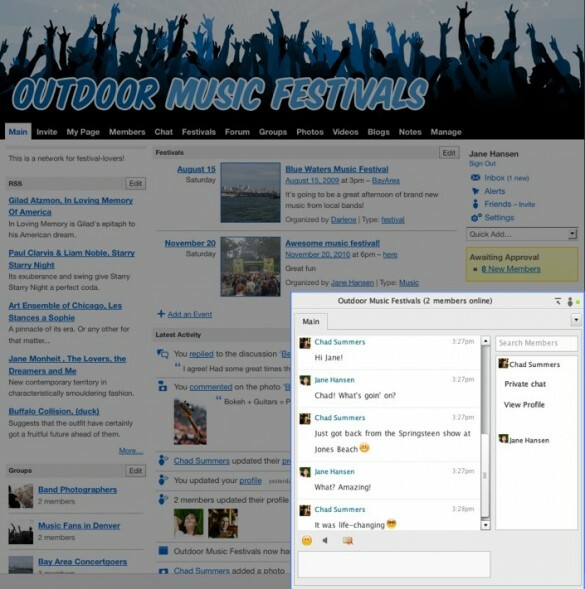 You can participate in the chatroomÂ on yourÂ Ning Network by accessing the Chat bar at the bottom of the page, by going to the Main Page Chat module, or by going to the Chat tab. From the Chat page or module, you can see the number of members signed into Chat and toggle your status as online or disconnected from Chat. When you sign in to a social network with the Chat feature on it, you will automatically appear as “online” in the chatroom. In the right column, a list of members currently in the chatroom appears. Clicking on a member’s profile photo pops up a dialogue that allows you to view their profile on the social network or initiate a private chat with them. When the member accepts, the two of you will be placed in your own separate chatroom. You can hop back into the main chatroom by clicking the “Main” tab.